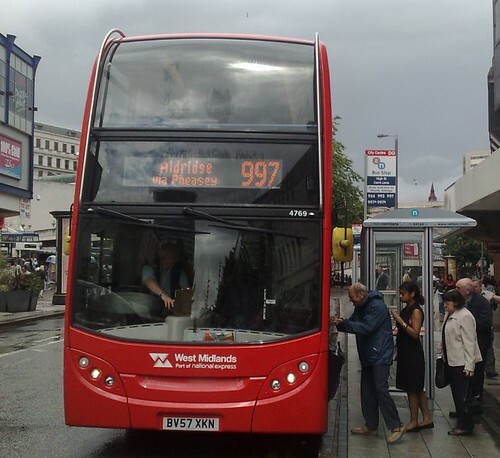 One afternoon last week, I had cause to catch TWM‘s 997 bus from central Birmingham to Great Barr, while my car was in the garage, for its annual MOT test (it passed, I’m pleased to say). I have mixed views on public transport: on the one hand it’s a good thing (TM), in that it’s available to all, environmentally friendly, and so on, but on the other hand, it usually involves the kind of user-experience which makes it undesirable for anyone who doesn’t have to use it through lack of choice. I had already used the 997 into Birmingham that morning. It’s a limited stop service, and I must say I had been impressed that the level of comfort was higher than I was expecting. I wasn’t sure when where to catch the bus for my return journey, so looked up the route on the Transport Direct website. The way that site works makes it impossible to link to the relevant timetable, but as this screenshot shows, they clearly say that the service departs from Carrs Lane in Birmingham City Centre. I arrived in good time for the advertised departure, but none of the three bus stops in Carrs Lane listed the 997 as stopping there. Purely by chance, I happened to see the 997 turning into Carrs Lane, from High Street, only to stop at a pedestrian crossing. I indicated to the driver that I wished to board, and he kindly opened the doors and allowed me to do so. I subsequently found that the 997 does not stop in Carrs Lane, but around the corner — and earlier on its route — at stop DG, on High Street (map here). 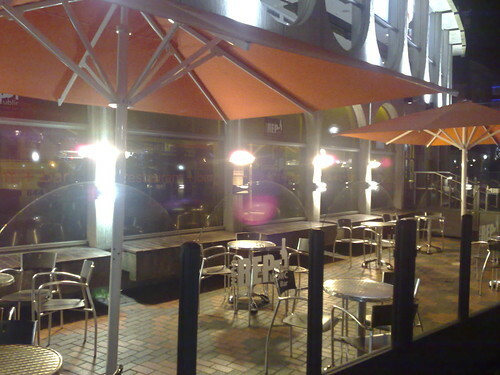 The above picture shows the corner of High Street and Carrs Lane. The bus stop on the extreme left is stop DG, on High Street. On the extreme right, it is just possible to see stop DH, the nearest on Carrs Lane. Note also the pedestrian crossing at the start of Carrs Lane. The bus I boarded had already departed from its stop. Had it not been for the pedestrian crossing and the kindness of the driver, I would have missed the bus, and thus missed the chance to pick up my car before the garage closed. TWM and Transport Direct need to work together to eliminate erroneous information from the latter’s service, not least if they expect to entice car drivers onto public transport. Triple tags (known as Machine Tags on Flickr) are a way of tagging web content with tags having three parts: a namespace, a predicate and a value. This means that we can differentiate between content about a Beagle dog (tagged taxonomy:vernacular=beagle) and Darwin’s ship, HMS Beagle (tagged maritime:vessel=beagle). Of course, that relies on everyone using the same tagging schema (my two examples could also be tagged with, say, pet:dog=beagle and history:ship=beagle). Fortunately, communities of web authors are agreeing on such schema. In other words, the coordinates of the place where I took the picture (pages using that schema are also often tagged with “geotagged“). It is then possible for Flickr to display that picture overlaid on a map of the location. 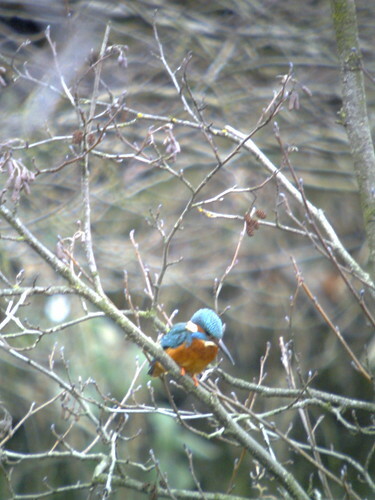 which gives the scientific name (binomial or binominal) of the Common Kingfisher, Alcedo atthis, including the Genus, Alcedo. Hash tags are parsed by three sites that I know of (there may be others — if so, please let me know): Hashtags (e.g. Hashtags for #blog), Summize (Summize for “#blog”) and Twemes (Twemes for “#blog”). Disappointingly, none of the three hash tag parsers above managed to understand these. They all see “#geo:lat=52.478342” as just “#geo” and “#taxonomy:binomial=Alcedo_atthis” as just “#taxonomy”. Wouldn’t it be great if services which parse hash tags in Twitter messages also recognised “hash-triple-tags”?